“Chairman Ma” is what my irreverent older son called me when he heard of our recent elections. I warned him about my little red book and said that anyway, as a language teacher and an unreconstructed feminist I am Chairwoman – lets get the gender right! – but lets not take ourselves too seriously either! What is serious and worthy of congratulation, is that you, the members at the A.G.M., have brought us back from the brink and elected excellent office-bearers in Pauline, Frances, Moya and Monica to take the QuiltersGuild of Ireland into the future: ideas are buzzing about; plans for next years Retreat are well in train; Frances is posting a flow of information on the website – see the items below – and Monica is managing the new subscription arrangements. 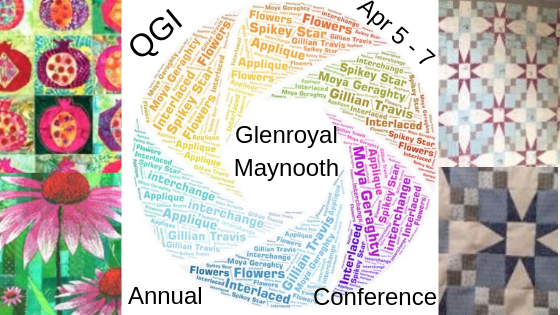 My thanks too to the outgoing Committee members for serving the QGI so well for so long, and especially for coping with last minute rearrangements occasioned by the illness of two of our tutors at the recent Retreat. We hope that Alicia is well recovered by now and that we will see her over here sometime in the future, and thank Marsha for soldiering on when she was still feeling quite wobbly. Remember their websites: www.aliciamerrett.co.uk and www.marshamccloskey.com . Today (Saturday 23rd March) I should be at a Sewing Saturday with the QGI Northern Lights group at Ballydougan, near Gilford, Co. Down, but we have about 6 inches of snow so I am going nowhere! Round Ballydougan it is clear, however, and I am wondering how many people turned up to sew. We are quite a busy little group – our programme is on the website here. In April we have Gaye Grant of the Fennel Shed coming to take a workshop for us. If there are other QGI groups out there, please get in touch. If we can publish your whereabouts there may be ‘lone quilters’ who would like to join you. And if you are ever up north when we are meeting at Ballydougan you would be very welcome to call in. There is a map of sorts on our programme. Contact the QGI at info@theqgi.com or me at jane.winters1@btopenworld.com . I know that not everyone is over-enamoured of the internet, but, for the moment anyway, it is our best way of keeping in touch, so please keep looking in, join the blog and add comments if you like, send us news and photos of what you are doing. The stout-hearted may even venture into the Facebook page!